One of the struggles many marketers, including real estate agents, have on Facebook is how to encourage engagement with what they post. Once you have thousands of followers, it’s not as big of a problem because you will find at least one or two people that will have something to say. But if you have a dozen or even a couple hundred followers, it’s a lot more difficult to encourage people to comment and engage with what you post. Here are some ideas on how you can encourage people to engage in what you post. Facebook posts that contain a photo or video are many times more likely to be shared and noticed than those without. When people are quickly scanning their news timeline, is quite easy to skip over text-only updates and just notice the ones with interesting images included. So try to include a related photo or video with everything you post. Here is an example of a very visual post that is interesting, and a unique closet storage idea for shoes most people haven’t seen before. 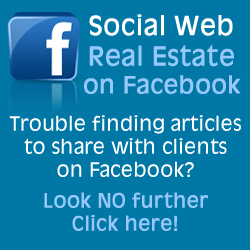 Post by Social Web Real Estate. You might be commenting on an interesting home decor idea, or on tips to increase the home’s value. But turn it into something that makes people more likely to comments, such as asking a question at the end. It can be something as simple as “what do you think?”, “is anyone adding this to their to do list?” or even just “yea or nay?” This encourages people to give their two cents on your question, which also shows up on many people’s timelines which expand your market reach. Surprisingly, post that ask for likes actually do get more likes. So if you post something, add for people to “like if you like this!” Do use it sparingly though, you don’t want to alienate people because every single thing you post you ask people to like. But once or week or so, especially if it is something you really want to have a broad reach to people outside of your followers, definitely ask for a like. As build more followers, you will definitely find it much easier to create engagement on your posts. But until you get to that tipping point of number of likes, definitely use these tracks to encourage engagements on your real estate Facebook page.